I like motorcycles – and last fall when I brought my bike in to get it ready for winter I asked the guy, “Hey I appreciate the work you do on my bike, I’d appreciate you allowing me to return the favor and letting me see if I can help you with your card processing. He had no allegiance to the company he was with, in fact he’d just recently switched to some company who totally did him wrong. Very quickly we found him a better program – one that actually matched how he wanted to do business, which included selling gear at bike shows – he does way more business than I expected. Of course I asked for referrals and he gave me two right there, which I got after immediately and landed quickly. But while I was there I asked, “Bike shows you say..? 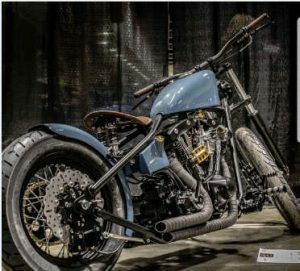 I’ve been thinking about a custom bike…” Well, of course you know where this leads – over the winter he built a very cool bike for me that won 4th place in the Donnie Smith Bike Show. I saved about $15,000 over the cost of some other shop doing the work because I helped him out of his old card processing arrangement. I also helped with the bike and it was great advertising for him at the show. Of course all that’s fun, but I figure that with his account and the businesses that he turned me on to (like his father’s construction business, a company that I also landed and sells all kids of bike fluids and other stuff) that over time it almost covers the entire cost of my new bike. No networking meetings, no cold calls, pure 1:1 conversations and organic networking, same way we’ve added 1000’s of accounts – and these relationships stick. There’s a lot of fun to this business, beyond just business, but the business can get you a lot of fun too. You’re on the FFUSA team! You have about 100 years of combined record-setting experience just a phone call away – we’ll help you strategize, target, close deals and get to the point where you have a solid income that takes little time to maintain.– Call us, we’re here for you.